My world through photography: Why I'm backing Method Press and why I think you should too. Why I'm backing Method Press and why I think you should too. Method Press is an art-filled idea magazine celebrating lo-fi thinkers. It is a consensus-based, not-for-profit, member run/owned, collectively managed magazine madly tracking down art as it moans to record its progress in history. We are not only interested in the making of art but in the art in the making. Method Press Kickstarter is to help Method Press pay their writers, buy better software and send copies of the magazine to the artists they feature. Help them at http://www.kickstarter.com/projects/1212188498/launch-method-press-issue-04?ref=card. 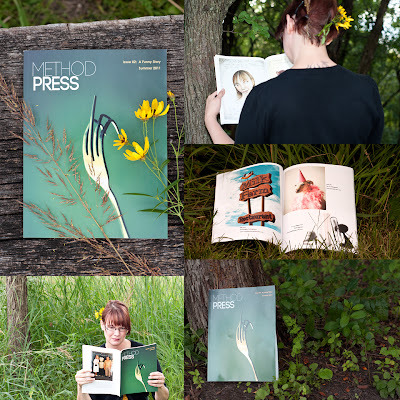 Method Press is a member run, volunteer run one of a kind magazine that features both well known and lesser know artists of our time in a beautiful print magazine. The magazine's global vision has a team that works globally from Australia to Portland to Brooklyn and in between. My first Method Press print issue was Issue 2, which I have photographed and share above. I was impressed not only by the great content, but by the overal quality. The magazine was and is just beautiful. I participated in Issue 3, both as a writer and photography contributor. The amount of work the team puts in to prepare this magazine is incredible and they are all so talented. I am backing Method Press through their Kickstarter campaign because slowly it seems that print is dying in favor of digital, that big corporate is having more control crowding out small independent. This magazine keeps alive the print medium and brings to life artists and projects that might never be found or shared otherwise. It's helping small indie businesses and artists worldwide share their work and telling the stories behind the scenes of these many talented individuals. If you support the arts, indie businesses, Etsy, handmade, or any of that, I encourage you to check out Method Press and if you are able to help, even with just a dollar, know that it helps. If you can spread the word, that helps too. Visit the Launch Method Press Kickstarter and show your support.